Moenchengladbach/Germany, January 9, 2019 – Publisher astragon Entertainment and weltenbauer. SE are happy to present the first set of road construction machines of the upcoming Construction Simulator® 3 for iPhone® and iPad® as well as smartphones and tablets using the Android™ operating system. 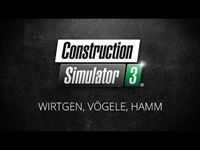 Thanks to a new partnership with the German WIRTGEN GROUP, mobile gamers will gain access to officially licensed vehicles by the WIRTGEN, VÖGELE and HAMM brands for the first time in the history of the popular game series. ©2018 astragon Entertainment GmbH. © 2018 weltenbauer. Software Entwicklung GmbH. Published and distributed by astragon Entertainment GmbH. Construction Simulator, astragon, astragon Entertainment and its logos are trademarks or registered trademarks of astragon Entertainment GmbH. weltenbauer., weltenbauer. Software Entwicklung GmbH and its logos are trademarks or registered trademarks of weltenbauer. Developed with the kind support of Caterpillar, ATLAS, Bell, BOMAG, CASE Construction Equipment, Doosan Bobcat, Liebherr, MAN, MEILLER Kipper, Palfinger, WIRTGEN GmbH, JOSEPH VÖGELE AG, HAMM AG and STILL. ©2018 Caterpillar. CAT, CATERPILLAR, their respective logos, "Caterpillar Yellow," the "Power Edge" trade dress as well as corporate and product identity used herein, are trademarks of Caterpillar and may not be used without permission. www.cat.com / www.caterpillar.com astragon Entertainment GmbH a licensee of Caterpillar Inc. ©2018 WIRTGEN, VÖGELE, HAMM and their respective logos are trademarks of WIRTGEN GmbH, JOSEPH VÖGELE AG, HAMM AG or WIRTGEN GROUP Branch of John Deere GmbH & Co. KG and may not be used without permission. www.wirtgen.de / www.voegele.info / www.hamm.eu / www.wirtgen-group.com. astragon Entertainment GmbH is a licensee of WIRTGEN GmbH, JOSEPH VÖGELE AG and HAMM AG. All other intellectual property relating to the construction equipment, associated brands and imagery (including trademarks, designs, and/or copyrighted materials) featured in the game are therefore the property of their respective companies. weltenbauer. Software Entwicklung GmbH is a developer of computer games, interactive applications and visualizations. Since 2006 weltenbauer. has implemented a great variety of projects in the games, serious games and interactive segments. This has enabled the team to gain extensive experience in multi-platform development for mobile devices, consoles, desktop systems and browsers. The weltenbauer. team consists of 24 permanent employees and free-lance experts from the fields of 3D computer graphics, conceptualization, real time and web development. Find more information on www.weltenbauer-se.com and www.facebook.de/weltenbauer.